There is nothing new about ultrasonics as a means of protecting yacht hulls from the dreaded grass and barnacle build up! But chatting with Sam Crawford director of the UK based family run business CMS Marine at a recent boat show, we got the impression that their system, Sonic Shield has been refined and progressively developed to a stage where its now a serious contender in the; ‘what else if not poisonous paint’ market! 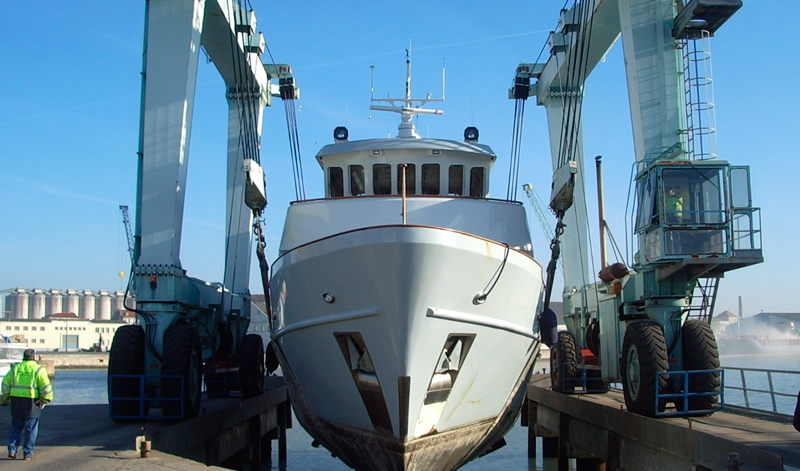 All boat owners are well aware of the problem that antifouling creates. Annual or Bi-Annual haul outs are not only costly and time consuming, but they are also lost money in the fact that you are never addressing the source problem of the microorganisms. According to CMS Marine the break even point of their SonicShield system depends on boat type and location. But tests have shown that for a 47 ft Yacht residing in the Solent UK you can expect to break even in year 2, based on a generous 2 Yearly traditional antifouling. They say that in every year after this you will be saving yourself time and money. For us, the refreshing thing about Sam’s approach was that he didn’t claim to have the golden panacea for all antifouling ills in his toolbox. He admits that sea conditions, hull shapes and construction materials offer an endless number of variables, and that in some cases, even his well advanced technology might be less effective than expected. His philosophy is don’t promise the earth, by showing photos of hulls just hauled out, supposedly after two years in the water, without so much as a hint of green slime on them! For a 10 to 20 metre boat, the standard system offered by CMS consists of three transducers (I forward and 2 aft) bonded to the inside of the hull with epoxy, and driven by an intelligent control unit that will run from the yacht’s 12 volt dc battery bank, or 220 volt ac shore power. The kit comes with all the stuff needed to install it. Prices starting at 999 GBP (excluding tax) for boats in the 10 to 20 metre range, and at 649 GBP for boats under 10 metres. And Sam offers to take it all back if it doesn’t work, less a handling charge of just 75 pounds. This seems like a fair offer from a confident supplier, and the fact that CMS sold 500 systems last year seems to underline their faith in the product.